What Can I Do With a Bachelor’s in Criminal Justice Degree? What Will I Learn in My Bachelor’s in Criminal Justice Program? Careers in public service and law enforcement require a passion for protecting and serving the community. Coursework for an online criminal justice degree builds on real-life case studies, sociological research, and in-depth historical studies to prepare students for careers as police officers, immigration specialists, crime scene investigators, immigration officers, and FBI agents. In coming years, job openings for police and detectives will rise by 4%, and specialized positions in criminal justice, like forensic science technicians, will increase by 27%. The online criminal justice bachelor’s programs below provide affordable education that will make you far more attractive to employers in the criminal justice field. Time to Complete Full-time online students typically complete the degree in four years. Credit Hours Most programs require 120 credit hours. Accreditation Many programs are regionally or nationally accredited. A few programs are also accredited by the Academy of Criminal Justice Sciences. Additional Info Some positions may require professional law enforcement training. Specialists in forensic science or legal advisors often pursue advanced education. Students at UCF can choose to pursue either a BA or a BS in criminal justice, both available entirely online. Each program combines a general education curriculum with targeted, upper-level criminal justice courses to ensure distance learners leave prepared to apply critical thinking and analytical skill to their roles in the field. Graduates typically work in law enforcement, law, corrections, or private security at the local, state, and federal levels. Alternatively, many choose to pursue master's degrees in related fields. To fulfill program requirements, degree candidates must complete 120 credit hours. Students may also opt to complete up to six credit hours of upper-division coursework in the form of an internship, which distance learners can arrange with the criminal justice department's internship coordinator. While UCF's online criminal justice degrees include entirely web-based courses, some minors or electives may require on-campus attendance. Nationally and internationally acclaimed as one of the leading universities in criminal justice studies, FIU offers students the opportunity to earn their bachelor of science in criminal justice entirely online. Available through the university's School of International and Public Affairs, the comprehensive online bachelor's in criminal justice program prepares distance learners for careers in law enforcement, homeland security, corrections, and private security, from the local to the federal level. To earn their online criminal justice degree, students must take 120 credit hours and work with a success coach as they progress through the curriculum. Classes start three times per year -- in the fall, spring, and summer -- and distance learners can complete all courses online in an asynchronous format. FIU provides cheap tuition rates for Florida residents -- just $213 per credit hour -- while out-of-state students pay slightly more. Working professionals looking to fit their bachelor's degree into a busy schedule should consider FHSU's flexible bachelor of arts and bachelor of science degrees in criminal justice. With both degrees available fully online, FHSU's program caters to distance learners who have already completed some college coursework and makes the transfer process simple. Graduates can advance to higher ranks within their current careers, working for the U.S. Secret Service or as federal agents, law enforcement officers, and victims advocates. To earn an online criminal justice degree, students must complete at least 124 credit hours, including 55 credit hours of general education courses. FHSU boasts affordable tuition rates and a variety of financial aid opportunities, like scholarships and student loan advice. Applicants must submit all transcripts from prior institutions of higher learning. Those over the age of 21 do not need to submit ACT or SAT scores to be eligible for admission. Midway delivers courses in its entirely online bachelor's program in criminal justice in an accelerated, eight-week format. Distance learners take advantage of five start dates per year, and can earn their degree in as few as 24 months (dependent on transfer credits). The school's bachelor of science in criminal justice program features professional, experienced, and highly qualified faculty. Graduates find success in fields like homeland security, law enforcement, and corrections. Coursework within the program emphasizes criminal investigation, but the curriculum provides degree candidates with a comprehensive understanding of the criminal justice system as a whole, including the causes, processes, and consequences of crime. To earn their criminal justice degree online, distance learners must complete at least 120 credit hours, in addition to a cumulative capstone project that challenges them to apply their newly acquired knowledge to a real-world issue. Midway offers affordable tuition rates, and does not charge out-of-state students extra fees. 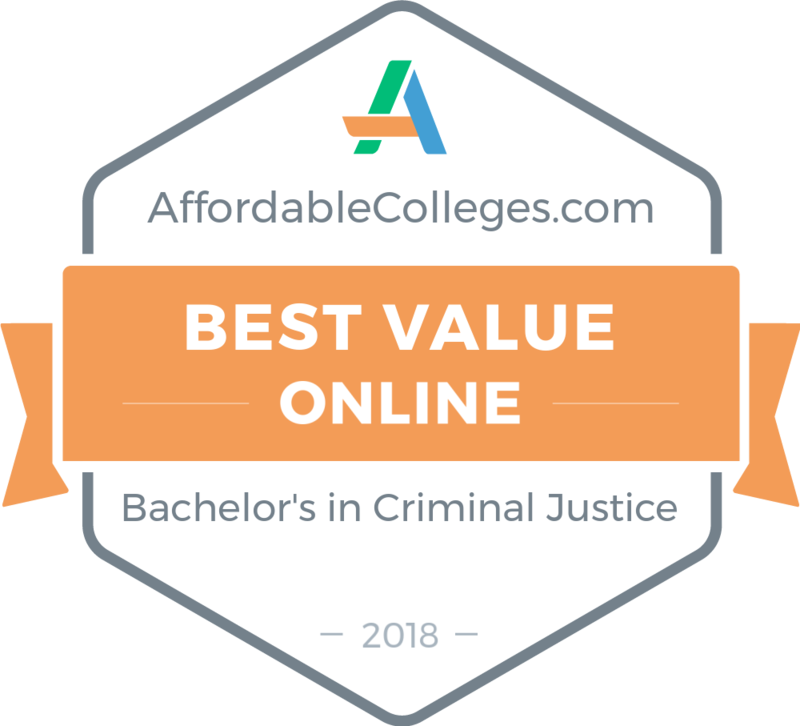 UMass Lowell provides students with the opportunity to earn their bachelor of science in criminal justice either entirely online or through a hybrid format that includes some on-campus courses. Featuring a combination of a solid liberal arts core and a focus on upper-division, career-centric coursework, the school's criminal justice degree online endows distance learners with computer skills specific to the field to transform them into competitive employment prospects. To graduate, degree candidates must earn 120 credit hours and maintain good academic standing, with an overall GPA no lower than 2.2 and a minimum GPA of 2.5 within the criminal justice major. Those hoping to pursue their master's degree at UMass Lowell after completing the affordable bachelor's program can complete two graduate-level courses as part of the required 120 credit hours. Amridge's criminal justice degree features many facets, leading students through courses in general education, human relations, communication, development, principles of justice, organization, and leadership. Degree requirements also include instruction on the Bible, social sciences, and an introduction to ethics. Graduates of the school's bachelor of science in criminal justice program can apply their knowledge in the field in accordance with their Christian faith as effective prison ministers and law enforcement chaplains. To graduate with their online criminal justice degree, students must complete a minimum of 128 semester hours, including 40 at Amridge, with a GPA of 2.0 or above. Additionally, distance learners must pass a capstone course and an accompanying exit examination. Finally, students must pass Amridge's General Competency Test to earn their degree. The university welcomes transfer credits, offering a degree completion option. Available through the school's Department of Public Justice, SUNY Oswego's bachelor of arts in public justice requires students to choose between three concentrations: criminal justice, human services, and legal studies. The school also encourages degree candidates to pursue a minor, with available options including forensic science, peace and conflict studies, and public justice. SUNY Oswego's online criminal justice degree primarily focuses on causes of crime through sociology and behavioral sciences. However, distance learners must also complete an intensive core curriculum in liberal arts. Graduates often pursue careers in law enforcement, court administration, and mediation. Alternatively, many students who complete the school's criminal justice degree online choose to further their studies with graduate-level courses. The school permits transfer students to apply as many as 30 general education credit hours toward their criminal justice degree. With Public Justice Department approval, degree candidates may transfer up to 12 credit hours of upper-division coursework. SUNY Oswego boasts some of the most affordable tuition rates in the country for in-state students, but does charge higher fees for non-resident learners. UNO prepares criminal justice students for fulfilling careers as federal agents, corrections officers, and law enforcement personnel. Distance learners can earn the school's bachelor of science in criminology and criminal justice completely online; students may also elect to complete their courses in a hybrid format, taking some courses at UNO's regional Lincoln or Omaha campuses. As they progress through the curriculum, degree candidates work to understand the underlying causes and theories of crime, as well as the ways in which the criminal justice system works to respond to such incidents. To graduate, distance learners complete at least 120 credit hours while maintaining a GPA of 2.0 or above. UNO offers its online criminal justice degree students hands-on learning opportunities, including a London study abroad program in which they can gain an understanding of criminal justice in the UK, in addition to a wide range of available internships. Past students interned with the U.S. Marshal's service, the local sheriff's department, and the Nebraska State Patrol. NSULA allows students to pursue nearly 40 undergraduate degrees entirely online, including a bachelor of arts in criminal justice. As they earn the required 120 credit hours for the degree, distance learners develop in-depth comprehension of a range of factors that influence the U.S. criminal justice system. Additionally, students learn principles of sociology, psychology, and political science in order to understand why crime happens and how it can be prevented. The affordable program, available through the school's Department of Criminal Justice, History, and Social Sciences, features an annual job fair to provide students with networking opportunities and facilitate professional success after graduation. Applicants must submit official transcripts (high school or other college), along with ACT, SAT, or Accuplacer scores. In addition, all male prospective students ages 18-25 must provide a copy of their Selective Service Registration card in order to be eligible for admission to this criminal justice degree online. FSU's bachelor of science in criminal justice readies students for graduate-level courses in their chosen field, or to embark on careers in law enforcement, homeland security, corrections, and private security. Degree candidates must complete 48 credit hours of upper-division criminal justice courses, and many choose to include a minor as well. In addition, students must take a series of electives, inside or outside of the criminal justice field, in order to meet the credit requirements for graduation. While distance learners can complete only the elective and upper-division courses through FSU, the university works with North Carolina's community college system to prepare students to enter the major with their general education coursework. Those working towards their criminal justice degree online do not have to fulfill any internship requirements; however, the school does encourage such endeavors. To be eligible for an internship, students must maintain a GPA of 2.5 or above and must have completed at least 60 credit hours. At UofM Global, students can pursue an online bachelor of arts in criminology and criminal justice through the university's School of Urban Affairs and Public Policy. Expert, professional faculty guide distance learners through coursework that helps them understand the theories and practices of policing, corrections, violence, gangs, addiction, and international crime. The 120-hour curriculum focuses on the reasons behind crime, as well as how to intervene, in addition to critical evaluation of the U.S. criminal justice system. Students may choose to complete all of their courses online, or may combine their online coursework with traditional classes at the UofM campus. Degree candidates typically finish the program within four years. Distance learners who do not reside in Tennessee must pay a slightly higher tuition rate than their in-state classmates. Prospective students must submit applications for this online criminal justice degree for fall, spring, and summer by July 1, December 1, and May 1, respectively. WCU delivers its bachelor of science in criminal justice online or on-campus, though only online students may elect to pursue a concentration in administration of justice. The school's two-tiered admissions process means that students who aim to earn their criminal justice degree online must first gain acceptance to the university, and then subsequently to the major. To be eligible for admission, distance education students must have maintained a GPA of at least 2.0 in all previous college coursework. The school's criminal justice program covers a breadth of topics, including criminology, ethics, diversity, and the justice system. Graduates from the program pursue careers in law enforcement, law, homeland security, corrections, private security, and as federal agents. WCU provides extraordinarily cheap tuition rates for North Carolina residents, at $152 per credit hour, but out-of-state students must pay significantly more. NCCU's Department of Criminal Justice offers distance learners the opportunity to earn their bachelor of science in criminal justice entirely online. The curriculum challenges students to think critically about criminal justice, as well as analyze the underlying causes of crime and how it can be prevented. Degree candidates in NCCU's criminal justice program may choose a concentration in law enforcement, corrections, homeland security, or juvenile justice. Any students who do not have at least one year of criminal justice experience must complete a practicum course. Distance learners must complete a total of 124 semester hours to earn their online criminal justice degree, the last 30 of which they must earn through NCCU. Graduates leave with an in-depth understanding of the various agencies, personnel, and history of the U.S. criminal justice system. Applicants to the program must have completed at least 18 semester hours in required courses (including English, math, sociology, and psychology) with a minimum 2.0 GPA. ASU Skysong's online bachelor of arts in criminology and criminal justice challenges distance learners to analyze the underlying causes of crime and how to mitigate both its frequency and effects. The university delivers courses that speak to a range of disciplines, including the courts, law enforcement, and corrections. The criminology program boasts expert faculty with vast experience in their fields, including policing, gangs, fraud, corrections, and the judiciary system. Classes last for just under eight weeks, and distance learners typically enroll in two or three courses per session. To gain admission to this criminal justice degree online, prospective students must have a minimum GPA of 2.5 in all high school or previous college coursework. Additionally, applicants must have graduated in the top quarter of their high school class, maintained at least a 3.0 GPA, have achieved higher than a 22 on their ACT, or scored above a 1110 on their SAT. ASU Skysong provides a variety of financial aid opportunities, including scholarships and grant programs. UTPB's bachelor of science in criminal justice program, available through the Social Sciences Department, functions as part of an online consortium with the school's campuses in Arlington and Brownsville. The criminal justice major requires students to earn 60 credit hours of upper-division courses in addition to six elective hours. Program applicants should complete lower-division credit hours prior to electing to pursue the criminal justice major. Courses cover a range of topics, including legal aspects of evidence, genetics, institutional corrections, and toxicology. Distance learners must complete a total of 120 semester credit hours to earn their degree from UTPB. First-time freshmen and international students must submit applications for this online criminal justice degree by July 15, November 15, and April 15th for fall, spring, and summer, respectively. UTPB accepts applications for transfer students on a rolling basis, but recommends that prospective students submit their application at least 30 days before their desired start date. At USD, distance learners may elect to pursue their bachelor of arts or bachelor of science degree in criminal justice, and can complete either program in an entirely online format. Coursework begins with a solid foundation in general education, where students develop the critical thinking and analytical skills necessary for success in upper-division courses. Next, degree candidates began work toward their major, covering a breadth of topics including juvenile criminal justice processes, social sciences, the history of the criminal justice system, and the processes of criminal justice at the local, state, and federal levels. Distance learners may choose to apply an internship to the requirements for this criminal justice degree online, and the university encourages work at a criminal justice agency in students' local communities. Those local to USD's campus can participate in the on-campus criminal justice club or the mock trial team. The school's fully accredited, asynchronous online programs feature not only rigorous academics, but also highly affordable tuition rates. Within EKU's robust distance learning programs, students can complete coursework entirely online. The school delivers online classes in accelerated, eight-week terms and features dedicated faculty devoted to ensuring each student thrives both academically and personally. EKU assigns each student an advisor who works with them throughout their academic career -- from the day they apply until the day they graduate. The school offers online criminal justice degrees through its College of Justice and Safety's Criminal Justice Department. Distance learners must complete 120 hours to earn their bachelor of science in criminal justice. Students may also opt to participate in the online homeland security degree, through EKU's School of Safety, Security, and Emergency Management. Students hoping to attend EKU should keep a sharp eye on application deadlines, as the university does not allow for rolling admissions. Apply by August 1 for the fall semester, December 1 for spring, and May 1 for summer. UNK offers a bachelor of science in criminal justice, in the form of a degree completion program, asynchronously and entirely online. The curriculum focuses on modern challenges the criminal justice system faces, and the program features expert faculty with extensive experience in their chosen fields. To be eligible to graduate, students must apply their newly acquired theoretical knowledge to real-world situations as they complete an intensive internship near the end of the program. UNK students have interned with Nebraska State Patrol and the National Security Agency, among other organizations. UNK offers start dates for this criminal justice degree online in the fall, spring, and summer terms, and encourages prospective students to apply at least one month ahead of their desired start dates. The university features affordable tuition rates, along with financial aid options like grants, scholarships, and work-study programs. Catering to busy, working professionals, OU offers its criminal justice program in asynchronous online, hybrid, or traditional, on-campus formats. The school advises students to choose whichever pathway best suits their schedules as they prepare for fulfilling careers in restorative justice, corrections management, police administration, and law enforcement. The program features a cohort format, meaning students receive support throughout their academic journey not only from faculty, but also from a peer group of other online learners. That peer group often develops into a professional network, helping graduates find jobs and connections in Oklahoma and across the country. OU sets tuition for in-state residents at a cheap $153 per hour, but non-residents must pay more. The school encourages all candidates for this online criminal justice degree to apply for a range of available scholarships, and works with students extensively to help them secure financial aid. Westfield State gears its entirely online bachelor's degree completion program in criminal justice toward Massachusetts community college graduates who want to pursue their bachelor's degree, but accepts students of other education levels as well. Classes cover topics like the American judicial system, research methods in criminal justice, and law enforcement and society. Courses in this criminal justice degree online begin five times per year, with 15-week fall and spring semesters, two accelerated, six-week summer sessions, and one accelerated, two-week winter session. Westfield State accepts applications on a rolling basis, but asks students to apply at least 30 days ahead of their desired program start date. The university offers an affordable tuition rate of $970 per year for in-state students, but out-of-state distance learners must pay significantly more. Students over age 60, however, can take all courses in the program at no charge. UAF's bachelor of arts in justice guides students through critical theoretical aspects of the criminal justice system and their real-world applications. Courses include an introduction to addictive processes, ethics and justice, gender and crime, and police problems. The school advises junior- and senior-level justice degree candidates to complete internships that help them develop their comprehension of the concepts they learn in class through hands-on experience. Upon completing the required 120 semester credit hours, distance learners graduate ready to take on careers in corrections, law, law enforcement, security, advocacy, and court administration. Prospective students should submit applications for this asynchronous criminal justice degree online by June 15 for the fall semester, November 1 for spring, and May 1 for summer. While all applicants must provide official transcripts (high school and other college), freshman and transfer applicants who have fewer than 30 semester hours must also submit scores from the ACT or SAT. Understanding the key principles, theories, and structures of the U.S. criminal justice system serves as the ultimate goal of FVSU's bachelor of arts in criminal justice program. The online criminal justice degree focuses on three subject areas as they pertain to the criminal justice system: law enforcement, corrections, and the courts. Designed for working professionals juggling careers and families alongside their education, FVSU's online programs feature a flexible, asynchronous format that allows distance learners to take courses on the schedule most convenient for them. The school also offers this degree path in a hybrid format, so students may elect to take some of their courses online and others on campus in the evening or on the weekends. All distance learners at FVSU pay the same tuition rate -- under $200 per credit hour -- regardless of their state of residence. The university works extensively with students to secure scholarships and financial aid, making FVSU an excellent choice for those seeking an especially affordable education. The first university in the state to develop a comprehensive Department of Criminal Justice, ULM has offered undergraduate programs in the field since 1970. Today, the department delivers a bachelor of arts in criminal justice that distance learners can complete entirely online. Degree candidates typically complete the required 120 semester hours to earn their degree within four years. Additionally, the university boasts an Institute of Law Enforcement, a specialized program for current law enforcement officers in Louisiana and surrounding areas seeking to further their education and training. ULM's Department of Criminal Justice graduates just 50-70 students per year in both the bachelor's and master's programs. Distance learners can complete courses asynchronously; however, for accelerated program completion the school advises taking courses in a hybrid format to take advantage of the more complete scheduling of on-campus courses. Students can complete on-campus coursework for this criminal justice degree online during the day, in the evening, and on weekends. Located in Waxahachie, Texas, SAGU has offered quality higher education since 1943. Today, the university expands well beyond its Texas roots, offering distance learners the opportunity to earn a range of degrees in an entirely asynchronous, online format. The school designed its online bachelor of arts in criminal justice to help students better serve "those who have strayed" and "those who have been wronged." Through a Christian lens, students learn to investigate crime and its causes, to understand the corrections system and other rehabilitation processes, and to critically analyze the U.S. critical justice system. Distance learners move through a variety of diverse courses covering topics like theories of criminology, correctional psychology, and criminal investigation as they earn their online criminal justice degree. In addition to the excellent academics, many students choose SAGU for its affordable tuition, currently even more accessible through a 15% tuition grant available to those who are just beginning their bachelor's degree. IU East's bachelor's degree completion program in criminal justice endows students with skills not only in their major, but also in management and communications to ensure their competitiveness in the field. As they progress through the curriculum, distance learners study the multifaceted U.S. criminal justice system through courses running the gamut from crime prevention to criminal rehabilitation. Designed for students with at least 60 credit hours worth of coursework, the criminal justice program can take as little as two years to complete. Students must maintain a minimum GPA of 2.0 in all major courses, and must earn at least 36 credit hours in 300-level or higher courses. Additionally, the degree includes various writing requirements, including a culminating writing experience required for graduation. Graduates of IU East's criminal justice degree online typically work in law enforcement, probation, forensics, and law. The university's online programs feature affordable tuition rates for Indiana residents and out-of-state degree candidates alike. SHSU's College of Criminal Justice offers students the opportunity to choose between two related undergraduate degrees: criminal justice and victims studies, both available through the Department of Criminal Justice and Criminology. The university takes pride in its friendly learning community, professors who are experts in their fields, and high-end, modern facilities -- including a mock courtroom -- should students choose to complete any of their coursework on campus. Distance learners can earn SHSU's criminal justice degree online within four years, or in less time with transfer credits. The degree requires students to earn credit hours in social sciences, like psychology and political sciences. Other courses within the program include cybercrime, forensics, victimology, white collar crime, and criminal investigation. Senior-year degree candidates may choose to perform an internship for credit, which provides hands-on experience and the opportunity to make connections within the field. Students may enroll in the fall, spring, or summer semester, and enjoy affordable tuition rates. Part of the Chapman University system, Brandman has provided working professionals and others with a challenging, flexible learning environment for more than five decades. Today, that commitment extends beyond the California campus to a range of online degrees to help working students juggle careers, families, and academics. Brandman's bachelor of arts in criminal justice guides students through coursework designed to help them explore why crime happens, the psychology of criminals, how the corrections system functions, and the role of homeland security in the post-9/11 United States. Students may opt to participate in any one of five available concentrations: corrections, forensics, homeland security, leadership, or victim advocacy. To be eligible for admission to the criminal justice degree online, prospective students must have completed at least 12 transferable college credits. Brandman offers discounted tuition rates to active-duty members of the military and their spouses. FSU's part-time, online bachelor's degree in criminology endows students with the necessary skills to successfully pursue graduate degrees and careers in criminal justice. The curriculum challenges distance learners to think critically and solve complex problems, working toward future roles in victim advocacy, crime intelligence, private investigation, and social services, among other fields. Available in an asynchronous format, FSU's online programs feature flexibility for working professionals. To graduate with an online criminal justice degree, students must complete 36 credit hours of criminology coursework (including at least 27 from FSU) and must maintain an overall GPA of 2.0 or above, but do not need to participate in any on-campus instruction. Prospective students must submit applications for fall, spring, and summer by July 1, November 1, and March 1, respectively. SJCNY's online criminal justice degree gives students a well-rounded education in the field. Degree candidates must take liberal arts classes for half of the 120 required credits, in topics like philosophy and political science. Courses in the criminal justice major include forensic bioscience, courts & civil liberties, and quantitative applications in criminal justice. Additionally, distance learners must complete a three-credit capstone course. Although the program doesn't feature concentrations, each professor brings expertise in a specialized area of research to the virtual classroom. Students taking a full course load each semester typically graduate with their online criminal justice degree in four or five years. The program serves as a great option for distance learners who already have some college credits or would like to earn credit through the Prior Experiential Learning Assessment, previous job or military trainings, or other skills exams. SJCNY accepts students on a rolling basis, and requires applicants to submit only evidence of a high school diploma. UHV's online criminal justice program features the same quality of instruction and academic rigor as its on-campus criminal justice program. Students can choose to earn their degree entirely online, on-campus, or in a hybrid format. The program includes liberal arts courses, in subjects like behavioral sciences and humanities, in addition to major-specific classes, like ethics of social control and research methods in criminal justice. Degree candidates must complete a minimum of 120 semester hours to finish the curriculum. UHV offers affordable tuition rates, especially for in-state distance learners. Students who do not reside in Texas pay more, but all degree candidates can take advantage of a variety of financial aid opportunities, including scholarships. Additionally, the university assigns each student a financial aid counselor to help them navigate their options for covering costs in earning this online criminal justice degree. Based in Nebraska, CSC delivers an affordable criminal justice degree to both in-state and out-of-state students. All distance learners pay the same tuition rate -- $260 per credit -- no matter where they live. The school offers the degree as a hybrid program, allowing students to take several courses online but requiring on-campus participation for others. Degree candidates can choose among five available concentrations: law enforcement, law, juvenile justice, corrections, and forensic studies. To graduate, students must earn a total of 120 credit hours, 57 of which they can complete through the criminal justice program. The school accepts a limited number of transfer credit hours earned at community colleges and four-year institutions. The typical time for earning this degree is four years. CSC offers internship opportunities (for 1-12 credit hours) and study abroad options that allow distance learners to customize their degree to fit their personal interests. In addition, the school awards annual scholarships, like the Watson Justice Studies Scholarship, to help students mitigate costs for this criminal justice degree online. Saint Leo's School of Education & Social Services offers a bachelor of arts in criminal justice entirely online. Degree candidates may elect to pursue a specialization in criminalistics, which endows them with basic skills in forensic science and evidence interpretation and analytics. Alternatively, distance learners can choose to concentrate their studies in homeland security. Regardless of specialization, courses in Saint Leo's criminal justice degree include forensic science, evidence collection, and crime scene investigation. Designed with flexibility for working professionals, the school's online program features an asynchronous format that allows distance learners to take their courses whenever works best for them. As such, the degree caters to working criminal justice professionals ready to advance in their careers or progress to graduate-level study. Saint Leo offers field placements to students without a criminal justice background to allow them to gain professional, hand-on experience. These placements can potentially lead to employment with organizations such as the U.S. Secret Service, the Drug Enforcement Administration, and the Florida Department of Law Enforcement. Students must complete a minimum of 120 credit hours in order to be eligible for graduation with their online criminal justice degree. Saint Leo provides highly discounted tuition rates for active-duty military personnel. The largest Christian university in existence, Liberty features quality distance learning programs. The school's 120-credit hour, online criminal justice degree offers a large number of concentrations that permit students to personalize their educational experience. Options include business administration and management, criminal psychology, crime scene investigation, homeland security, public administration, strategic intelligence, and juvenile justice. Degree candidates must earn 30 credit hours (and 50% of their major) through Liberty. Graduates find success in careers in corrections, counseling, social services, private/corporate security, home defense, and other fields. Current law enforcement officials and veterans can earn transfer credit for their professional and military experiences when applying for the program. Additionally, Liberty provides discounted, affordable tuition rates for veterans and current military personnel. Applicants must submit official transcripts (high school or other college) evidencing a GPA of 2.0 or above. Chaminade's bachelor of science in criminology and criminal justice provides students with foundational knowledge in criminal law, legal procedures, and the logistics of gathering and analyzing evidence. Distance learners who earn their criminal justice degree online can succeed in roles in public safety, corrections, probation, and criminal justice administration. The school's criminal justice program requires 120 credit hours, and typically takes students around four years to complete. In order to graduate, degree candidates must maintain a GPA of at least 2.0 for all courses completed at Chaminade, and they must complete at least 45 credit hours of upper-division criminal justice coursework. Additionally, students must complete at least half of their upper-division coursework through Chaminade. Courses in the curriculum include behavioral sciences statistics, juvenile deviancy and juvenile justice, introduction to law, and supervision and management. Available through Keiser Ft. Lauderdale's online division, the school's bachelor of arts in criminal justice introduces students to key areas in the field, including forensics, victimology, and juvenile justice. The curriculum's layout encourages degree candidates to think critically about how these disciplines interact to constitute the complex U.S. criminal justice system. Additionally, the program emphasizes research methodology, evidence analysis, and the trajectory of existing processes. In order to graduate, students pursuing their criminal justice degree online must earn 120 credit hours. Distance learners enjoy the same access to student services as on-campus students, including the opportunity to work with a career advisor who can help with resume and interview preparation. The university also offers a number of professional development workshops, and coordinates with the local community to keep students in the loop about job opportunities. Degree candidates also have access to student organizations, like student government or either of the two honors societies on campus -- Phi Theta Kappa and Sigma Delta. DBU's online criminal justice program favors elective and transferred courses, making it an ideal option for distance learners with previous experience or those wishing to explore other topics as they complete their major. The curriculum also emphasizes liberal arts and religious topics. Students enjoy a variety of options to customize their online criminal justice degree, with many available courses fulfilling requirements. Sample general studies topics include natural sciences, kinesiology, history, and fine arts. Courses in the criminal justice major cover subjects like constitutional law, juvenile delinquency, and economic crimes. Distance learners must earn a total of 120 credit hours to complete the program, including a minimum of 42 in upper-level coursework. Degree candidates can take all their classes online. Admission counselors help guide both transfer and experienced students through the previous credit verification process. To be eligible for graduation, students must maintain a GPA of 2.0 or above. Students in Concordia's management of criminal justice program train to apply critical thinking skills to pressing issues in the criminal justice field, whether they be legal, structural, or managerial. Graduates from the program find successful careers in law enforcement management, corrections, and court administration. They undertake roles at a variety of levels -- federal, state, county, and municipal. Subject-matter experts, Concordia's criminal justice professors boast extensive real-world experience and work to educate students from a Christian perspective. In accordance with the curriculum's religious theme, courses help students examine morals and ethics, in addition to how they will apply those principles to their professional careers. Distance learners at Concordia can earn their online criminal justice degree after completing 128 credit hours. Courses include interpersonal communication, Bible as literature, and substantive criminal law. Admitted students can begin their studies at any time. AP's bachelor of science in criminal justice features a concentration in homeland security. The degree guides students through coursework in terrorism and security, and includes elective courses covering subjects like law, public management, politics, psychology, and sociology. Graduates leave the program with an in-depth comprehension of both the theoretical and practical aspects of the field, poised to make a positive impact in their professional endeavors. Prospective students will find AP relatively affordable. The university welcomes transfer students, and accepts most transfer credits from accredited universities. Ideal for first-time freshmen, working professionals, and students with associate degrees, AP's bachelor of science in criminal justice prepares students to become the first line of defense in national security. Distance learners typically earn their criminal justice degree online within four years, depending on transfer credits. King's online criminal justice program serves as an excellent option for those looking to finish their studies on an accelerated track. Based in Tennessee, King offers its online program with the same curriculum as its on-campus degree. Prospective students must have earned 45 semester hours in order to be eligible for admission. These hours can come from previous college work, for-credit tests, past life experience, or through King's online offerings. In total, distance learners can transfer a maximum of 76 semester hours, over 60% of the total 124 required for the degree, into the program. King's criminal justice degree online requires students to complete 12 courses, or 48 semester hours, in the field. If degree candidates study year-round (including summer), they can finish the program within just 16 months. Concordia Saint Paul offers a criminal justice degree online that features an accelerated format. Instead of typical 12-week classes, most of the courses in the program last for seven weeks. Students can earn their bachelor's degree by completing 40 criminal justice credit hours. Courses cover topics like information literacy, constitutional law, troubled youth, and philosophy of values & ethics. The university's criminal justice degree bachelor's program appeals to active-duty military students as an affordable option, at only $250 per credit hour. Otherwise, all distance learners at Concordia Saint Paul pay the same tuition, regardless of their state of residence. Prospective students must submit official transcripts evidencing a minimum GPA of 2.0 in addition to a personal statement answering two questions about their personal academic goals. Applicants who have not taken any college courses must submit ACT or SAT scores. Students seeking a criminal justice degree online should consider McNeese an attractive option. The school offers a bachelor's degree in criminal justice that allows distance learners to take only one or two classes at a time. The program delivers courses in two seven-week sessions per semester. Degree candidates can choose to complete the curriculum entirely online, or can opt to take classes on campus in Lake Charles, LA. Graduates find success working in law enforcement, social work, correctional facilities, and crime scene investigation, among other fields. McNeese's online criminal justice degree features affordable tuition for in-state residents, but those living elsewhere must pay significantly more. The school offers financial aid opportunities to distance learners who enroll in six or more credit hours at a time. Boasting more than 200 years of educating experience, including 30 years of criminal justice programs, Norwich delivers one of the most highly ranked online criminal justice degrees in the United States. Students can choose to earn a general criminal justice degree or focus their studies through an intelligence and security management concentration. Regardless of specialization, all degree candidates must complete a field study and a final capstone project. All distance learners at Norwich need 30 credit hours for admission to the criminal justice online degree program. They can transfer an additional 60 credits toward their degree through classes or previous-experience tests. Most students finish the program in under two years. Norwich features a dedicated admissions counselor for its online criminal justice degree, which offers three start dates per year. The school provides discounted tuition rates for active-duty members of the military. NCU delivers an interdisciplinary Christian education for students seeking an online criminal justice degree. The school offers the accelerated program year-round, with sessions lasting for eight weeks. Full-time students take two classes per session. Degree candidates may choose to take a few classes in person at NCU's campus in Eugene, Oregon, with classes available one night per week. Courses cover a variety of topics, including terrorism and counterterrorism and criminology. Graduates work as corrections officers, FBI agents, court clerks, and insurance investigators, among other roles. Incoming students can work with admissions counselors to determine which of their previously earned credits will transfer and how to receive credit for life experiences through the Prior Learning Assessment. All distance learners at NCU pay the same tuition rates, no matter where they live. Students all over the country can take advantage of CSU San Bernardino's affordable online criminal justice degree. All distance learners pay only $260 per semester unit, regardless of their state of residency. Additionally, the school works with incoming students to secure financial aid opportunities. In order to gain admission to the program, distance learners must have completed 60 semester units of coursework and have completed CSU San Bernardino's general education requirements, all with a GPA of 2.7 or above. Admitted students complete 84 semester units through 21 online courses to earn their degree with a total of 180 semester units. The program contains two prerequisites, four university-required classes, six core criminal justice courses, and nine electives that students can use to customize their degree. CWU offers an online bachelor of arts major in law and justice. While the major only requires 60 credits, composed of eight core classes and seven electives, the university requires 180 credits to graduate. Admission to the program requires a 2.25 minimum GPA and sophomore or greater standing. The degree prepares students for graduate school or a variety of careers in the criminal justice system. The curriculum focuses on topics such as crime in America ethics, community and social justice, and research methods. Distance learners can complete all online courses in an asynchronous format. Applicants with at least a 3.4 GPA and who meet minimum admission criteria can automatically enroll in this online criminal justice degree, regardless of SAT/ACT scores. All other applicants must have a minimum 2.0 high school GPA to be eligible for admission, and must submit SAT/ACT scores. At Penn State, distance learners can earn their bachelor of science in criminal justice entirely online. The same, expert, professional faculty members who teach classes on campus deliver courses in the online program, in an asynchronous format. Certified by the Academy of Criminal Justice Sciences, Penn State's criminal justice degree online passes incredibly rigorous learning quality standards. Students in the program have the opportunity to earn one of the most academically complete and respected degrees available, and pay relatively cheap tuition. Coursework in the criminal justice track combines theoretical knowledge with practical education, and includes both general education courses and upper-level criminal justice courses. Penn State recommends that degree candidates in the criminal justice program elect to pursue a minor in homeland security, which opens graduates up to more career possibilities. Courses in the program cover subjects like criminology, ethics, law, sociology, and alternatives to incarceration. Students can earn VSU's bachelor of science in criminal justice completely online or in a traditional format at the local Georgia campus. The university boasts small online class sizes and gives degree candidates the chance to conduct research projects with faculty members. Along with an asynchronous course format, VSU also provides affordable tuition rates for online courses. The criminal justice degree requires 120 credit hours and includes coursework pertaining to comparative justice systems, organized crime, and forensic criminology. VSU considers applications for its criminal justice degree online on a rolling basis, and requires prospective students and transfer students with fewer than 30 credit hours to submit SAT/ACT scores and a high school transcript with their application. Transfer students with more than 30 credit hours must have a minimum cumulative GPA of 2.0 in all previous coursework. IWU delivers a bachelor of science in criminal justice completely online, but students may elect to take courses on the main campus or any of the university's satellite campuses throughout Indiana and Kentucky. The university expects students to bring at least 30 transfer credits to this bachelor's degree completion program. As such, degree candidates need to complete just 42 additional credit hours to graduate. Overall, the program typically takes distance learners about 18 months to complete. Courses in IWU's online criminal justice degree feature a synchronous format, requiring students to meet at a specific class time once per week. The program boasts a cohort format, allowing degree candidates to work within a group of their peers and provide academic, mental, and emotional support for each other. A Christian institution associated with the Wesleyan Church, IWU aims to guide students as they grow to understand their purpose and develop their own character. Crown encourages students to consider the social, political, legal, and ethical aspects in play within the complex American criminal justice system, all from a Christian perspective. As they complete faith-centric coursework, students gain an education that closely aligns with Christian values. Graduates of the school's bachelor of science in criminal justice program often pursue careers in law enforcement, juvenile justice, and corrections. As they progress through the curriculum, degree candidates work to understand the underlying causes of crime and the elements of crime mitigation. Crown pairs its criminal justice degree online with its online disaster and emergency management program, a combination that helps further students' comprehension of how the theories they learn in their criminal justice classes can apply to the real world in emergency situations. Crown accepts transfer credits and awards credit for real-world, professional experience within the field. The school offers highly competitive pricing, featuring relatively cheap tuition. Crown also works extensively with students to secure financial assistance, and 98% of current students receive some type of financial aid. FGCU's Department of Justice Studies offers a range of online degree pathways, including a bachelor of science in criminal justice. Designed as a degree completion program, this asynchronous program boasts flexibility to meet the needs of busy working professionals. Students may take their courses around their schedule, and can complete the entire major in as little as two years if they already hold an associate degree or at least 60 transferable credit hours. While the majority of degree candidates opt to complete the program in a hybrid format, taking some classes online and others on campus, distance learners can complete all major coursework without ever setting foot on the FGCU campus. Graduates of FGCU's online criminal justice degree pursue graduate-level coursework or enjoy fulfilling careers as law enforcement officers, corrections workers, or security personnel. Admission requirements include academic transcripts evidencing a GPA of "C" or better and the necessary 60 core curriculum credit hours. The university offers relatively cheap tuition, charging Florida residents just $168 per credit hour. After graduating with a criminal justice degree online, candidates enter careers in many avenues of law enforcement and public justice. While some positions involve intensive research and data analysis, graduates who become protection officers in the field experience dynamic work environments that change every day. Though not exhaustive, a sampling of possible careers is listed below. Police officers protect public safety and uphold the law. Day-to-day responsibilities include responding to emergencies, apprehending criminals, and investigating crimes. While a bachelor’s degree is not always required, many states mandate college coursework in addition to specialized training. Forensic science technicians collect, preserve, and analyze criminal evidence. The work is often messy and requires advanced problem solving skills. Many technicians pursue additional training in fields like toxicology, DNA, or pathology. Paralegals employ investigative and critical thinking skills to collect case materials, research legal standards, and assist lawyers with the preparation and presentation of court cases. Earning a criminal justice degree online, while not required, greatly assists paralegals in the field. Probation officers supervise the release of parolees and probationers after incarceration, including visiting their homes or workplaces, and are responsible for filing paperwork with the court and state. After completing an online criminal justice bachelor’s degree, many graduates pursue advanced legal training. Lawyers represent clients in the court system, and their responsibilities include interpreting laws, filing cases, and conducting research. An online criminal justice degree builds a foundation in community protection, but growth in the field typically requires advanced professional training. Many graduates advance to master’s degrees in law enforcement, master’s of laws degrees, or even JD degrees. Those with graduate degrees pursue management positions and earn higher salaries. A recent study by the Georgetown University Center on Education and the Workforce shows that college graduates holding a degree in criminal justice face an unemployment rate of 8.4%, but the unemployment rate for those with a graduate degree is just 3%. Criminal justice systems: Students explore the history and structure of the U.S. criminal justice system, compare legal traditions to global practices, and review introductions to prison, court, and police systems. Criminology: Students examine the nature of crime and analyze theories of crime using sociological and psychological tools. Crime statistics and research methodologies are surveyed alongside case studies. Introduction to corrections: This course inspects the American history of corrections and incarceration. Topics include the prison experience, release, community corrections, and current trends in rehabilitation. Gender, race, and crime: Students unpack the racial and gender implications of law enforcement, corrections, and court systems in the U.S. and use case studies to review the perspectives of minorities and women as victims, offenders, and practitioners. Juvenile law and court procedures: Beginning with a survey of juvenile law history, students explore the philosophical basis of juvenile justice programs and the legal rights of participants. Rehabilitation and treatment practices are discussed. Candidates earning an online criminal justice degree should carefully consider in which state where they will live and work. State governments dictate police training regulations, and some states offer higher salaries. Below are the five highest paying states for police and sheriff’s patrol officers. Peace Officer Standards and Training (POST) Certification: This certification is required for law enforcement officers. Exact specifications of this licensure vary by state, but most require completion of state-approved law enforcement training programs, a passing grade on a POST examination, a criminal background check, and firearm licensure. Forensic Scientist Certification: Several certificate options are available through the American College of Forensic Examiners Institute, each requiring continuing education courses, on-the-job training hours, and completion of an exam. These certifications designate an understanding of investigative practices and create opportunities for career advancement. Whether you plan to pursue a graduate degree or officer certification, you’ll need a bachelor’s degree from an accredited program. Regional, national, and private agencies award accreditation, which signifies a school meets certain academic standards. National accreditation, granted by institutions like the Distance Education Accreditation Commission, ensures the quality of vocational training programs. National accreditation is more popular than regional accreditation and typically means credits can be transferred between universities. Both the U.S. Department of Education and the Council for Higher Education Accreditation govern the activities of regional and national accrediting bodies. Beyond these accreditations, students earning a criminal justice degree online should see if their program is acknowledged by the Academy of Criminal Justice Sciences. With stringent requirements, this accreditation is only given to a few institutions and is not necessary for most corporate reimbursement or employer tuition aid programs. To finance your online criminal justice degree, take advantage of grants, work-study programs, scholarships, and loans. Learn about ways to reduce your expenses by completing your Free Application for Federal Student Aid, and review any scholarships offered by your state and local law enforcement agencies. Additional scholarships for criminal justice students are listed below. African American high school seniors pursuing careers in law enforcement are eligible for this scholarship from the National Organization of Black Law Enforcement Executives. Eligibility Requirements: Applicants must be Washington residents who are studying criminal justice at an accredited college or university. Full-time status is required for renewal. LGBTQ criminal justice students can apply for this scholarship offered by Out to Protect. Eligibility Requirements: Students must identify as LGBTQ and be enrolled in a police academy or criminal justice program. Recommendation letters are encouraged. This scholarship is awarded by BECA, Inc. to female high school students of color who are entering law enforcement programs. Eligibility Requirements: High school seniors who are women of color can apply if they hold a GPA of 2.5 or higher and plan to enroll in a criminal justice program at a historically black college or university. High school transcripts and a written essay are required. Offered by the Indiana Sheriff’s Association, this scholarship is available to students in criminal justice programs who are preparing for law enforcement careers. Eligibility Requirements: Applicants must be enrolled at an Indiana college or university and must be a member of the association or a member’s dependant. The Washington State Fair offers this scholarship for Washington residents planning careers in law enforcement. Eligibility Requirements: Applicants must be Washington residents studying criminal justice at an accredited college or university. Full-time status is required for renewal.